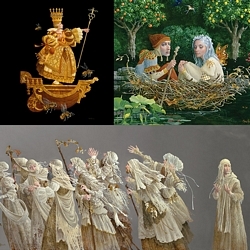 Image Size: 50"w x 22"h.
"Ten Lepers" by James C. Christensen is a Personal Commission Anniversary Edition of a Greenwich Workshop Fine Art MuseumEdition Giclée Canvas. 50" w x 22" h (unstretched). Edition determined by the number of orders received by January 20, 2017. $995US. $200 deposit required at time of order.